ALL Tickets and Reserved Tables are now SOLD OUT for this event - please buy tickets for WICKED, our sister party at Xfinity Live, instead before that party is sold out too! See you & your friends there! Be sure to "Like" & "Share" above to help spread the word!! Includes your cover charge, 5 huge rooms to party in, and costume contest. EXTREMELY LIMITED TICKETS LEFT - BUY NOW! Ticket sales ended at: 10/27/2018 at 11:00 PM $10.00 Ended 1! Ticket includes everything included in the regular General Admission tickets on Friday or Saturday night with admission to BOTH nights on one ticket. Free drink is only on Friday night. Includes everything listed with "General Admission" tickets, PLUS: Your own reserved table in the NBC Arena with Waitress service! Min 7 people for NBC booths. (gratuity not included) The only tables left are for groups of 4 people ONLY - just TWO tables left!! Includes everything listed with "General Admission" tickets, PLUS: Your own reserved table in PBR Bar & Grill with Waitress service! (gratuity not included) Incredible view of the bull riding arena all night long!!! Groups of 6-9. Includes everything listed with "Reserved Seating" tickets, PLUS: bottle service with 1 bottle of Vodka and 1 bottle of champagne on your table. Available to groups of 6 - 8 ONLY. JUST ONE TABLE LEFT!!!!! Includes everything listed with "Reserved Seating" in PBR Bar & Grill, PLUS: bottle service with 1 bottle of Vodka and 1 bottle of champagne on your table. Available to groups of 6 - 15 ONLY. Incredible view of the bull riding arena all night long!!! Looking for information on our WICKED Hallween Party on Friday? Please Click Here. Xfinity Live! 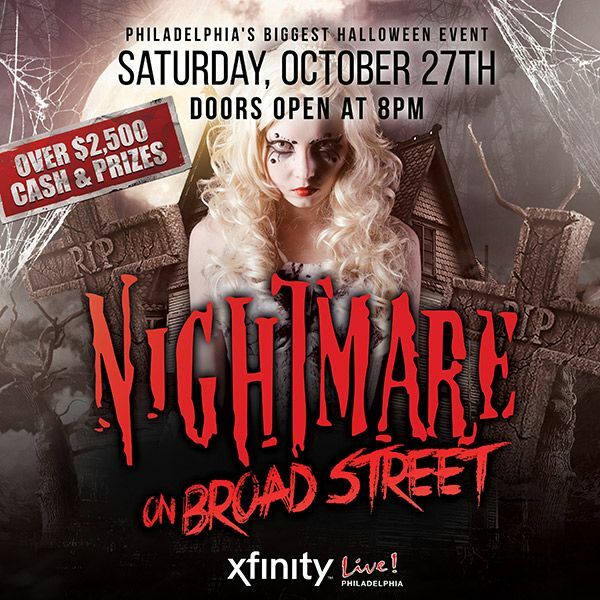 is about to get spooky during this year's Nightmare on Broad Street Halloween Party is back on Saturday, October 27th! Join us for the biggest, best Halloween bash in the city. Party starts at 8pm and goes until 2am sharp. Enjoy this nightmare extravaganza including 5 amazing venues, 50+ craft beers, multiple DJ's featuring Split Decision, bull riding, world famous Buckle Bunnies, cash and prize contests, giveaways, silent disco, karaoke, candy and more! Reserved VIP Seating and Bottle Service Available - see ticket options above - RESERVE ONLINE. Dress to Impress! Plan your BEST Halloween costume. We're giving away BIG $$ in cash and prizes! FREE PARKING IN ALL WELLS FARGO CENTER LOTS AFTER 8PM. Waitress service for cash bar drinks & food. Gratuity not included. Don't miss out - The sexiest, largest Halloween bash in the city is at XFINITY Live! Philadelphia! Costume Categories: Costume contest categories: Overall, sexiest, group, and more. View More Events Organized by Halloween in Philadelphia. Halloween in Philly - where will YOU be on the most fun party night of the year? We have Philadelphia's most incredible options on where to go and what to do! Open Bar - Bottle Service - Free Drinks - Costume Contests - AND MORE! This event is organized by Halloween in Philadelphia.